That old truck has been sitting in a field for ages. Maybe it was grandpa’s, or maybe you just spotted it and bought it. Either way, you need a frame up restoration. This will be a time consuming and potentially expensive process, and you need to weigh the benefits and understand the value of what you’ll have when you are done. First, it’s a good idea to research what your restored truck will be worth. Even if you don’t plan to sell it, you’ll want this information for insurance purposes, if nothing else. This information will also help you make decisions about OEM vs. aftermarket parts, paint color (original or your own choice), interior restoration or modernization, and many other choices you’ll need to make along the way. 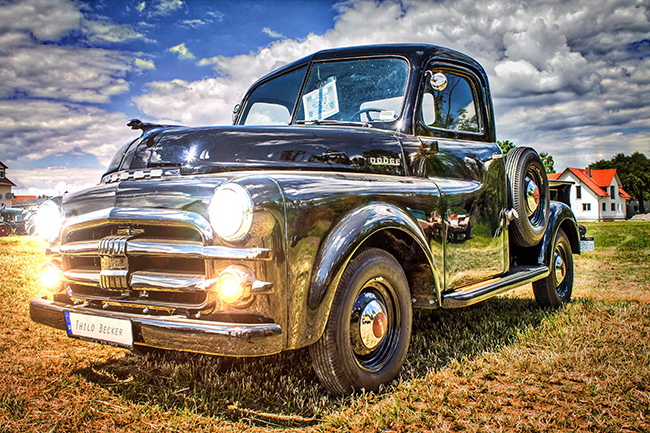 For example, a 1947-1953 Chevy Advance Design pickup can go for around $55,000 fully restored to original. A Dodge Power Wagon from the late 1940s to the early 1950s can go for $65K and a restored 1963-1973 Toyota Land Cruiser will fetch $75K or more. Knowing this value tells you how much time and money you can invest and still get a reasonable return if you decide to sell. Also, understand that trucks of this era only needed to do a couple of things: start every day and haul things. So modernization doesn’t hurt their value. Adding some newer technology, especially when it comes to the interior and passenger comfort and brakes and other safety features, can actually make them worth just as much or more to dedicated aficionados. If you have a rare Chevy C10, planning to restore it as close to factory as possible may be the best way to go, making the difference between a $50,000 value and a $100,000 value. This might mean searching for OEM parts all over the country, finding a body shop that can accurately match paint colors, and even having parts made for you. However, if you want more modern touches, there are conversion kits that are available, and there are probably many car clubs in your area with members eager to help. The point is to make a reasonable build sheet, count the cost, and make a budget and build plan that you can stick to. There’ll be snags of course. No restoration is without them, but with a build plan you’ll minimize these setbacks and be more likely to stay on track. One of the most common issues with a restoration is the wiring, since mice and other rodents love to nest in wiring and tear it out. This will be one of the most critical decisions in your build sheet. While some wiring harnesses are available, some rarer ones are not, and in some cases, you’ll have to make your own or have one made for you. This can be one of the most problematic issues with either an OEM full restoration or even a modernizing one. Ah, the old carburetors and gas tanks. Old gas gums them up and repairing them is a challenge. Sometimes replacing them is impossible. One of the first things you need to do is look at how much gas was in the tank and fuel system when the truck was parked, and what needs to be done to that system for it to function again. This can be the tipping point between modernization and restoration. The motor should be next on your list. There are two steps here. The first is to see what shape the existing motor is in. The second is to see what it would cost to repair or restore it. Machining for an old motor is sometimes very costly, and one of the reasons you see so many Chevy 350 motors in old restorations, even in non-Chevy autos. Count the cost and compare it to your benefit and value analysis. The body is also an important component. Just like the motor, evaluate the shape the body is in, and then compare that to the cost of buying new parts or restoration of the old ones. If you’re not a body man, you’ll need the help of one to make this evaluation. The key to a frame-up restoration is that you probably won’t be able to do it all alone, unless you’re a seasoned mechanic with a variety of skills. Even then, with help, the project will take less time and probably cost less, too. When doing a truck restoration and making your build plan, enlist the help of a team. Hire experts when you need them, and do everything you can yourself. Research ahead of time and determine your budget. Every restoration and rebuild is different, and some will encounter snags, but you can be successful if you keep all these tips in mind.